Posted by contrapuntalplatypus in A New Kind of Question, Childhood, Christianity, Environment, Nature, Saving the World, Through the Looking Glass. For a while, when I was about five years old, I would wake up each morning around 5 or 6 am. My room had an east-facing window through which I could see the masses of cloud lit with the flame-bright colors of sunrise. It was so beautiful, I thought, that maybe – just maybe – this would be the day that Jesus returned. I was raised in the Seventh-Day Adventist church, which strongly emphasized the Second Coming. Any moment could be the magical moment when it would happen – and we had to be sure that we were prepared. Of course, the church insisted that nobody could “know the day or hour”, a caution born out of its predecessor’s disastrous fling with Rapture mania in 1844. At any rate, I was determined to be ready, and I read my children’s Bible with great fascination – particularly Revelation, with its mysterious beasts, angels and fiery cataclysms. If Jesus did return in my lifetime, I was pretty sure it was going to be during such a brilliant sunrise, when the sky was already so majestically illuminated. And so each morning I watched in breathless anticipation…and mixed disappointment and relief as the sunrise faded. Similarly, I watched yesterday as the world crossed into 6 pm, May 21, 2011. No earthquakes, no crowds rising into the sky, no cars or trains suddenly colliding due to Raptured drivers. Of course, I really hadn’t expected anything to happen. Much less did I want billions of people to die in a fiery Apocalypse. But once again, somewhere inside me was…just a tiny little sliver of disappointment. Last week Kristy (a fellow Tweeter) and I were discussing Revelation and the Second Coming. She wasn’t a member of the May 21 movement (she describes herself simply as a “born-again Christian”). But she was adamantly certain that Jesus would return, probably very soon, and when he did, everything wrong with the world would just…vanish. We’d live with one another in perfect harmony, free from any temptation to treat each other badly. Our devastated planet would be replaced by a pristine paradise, untouched by human greed. And Satan himself – the source of all evil – would be destroyed forever. But, I argued, isn’t this a sort of a cop-out? Like a little kid going to their math teacher and saying “this assignment is too hard – just give me the answers?” And what about the suffering that we’re causing for countless millions (or billions, as things get worse) due to our misuse of the Earth’s resources? My mind came back to our conversation several times that week. Yes, it’s understandable to want someone to come solve our problems. Clean things up and give our world a fresh start. I think we’ve all had that feeling of being overwhelmed by all the things that are wrong with this world, to the point where we feel like just throwing up our hands: “Someone else can deal with this mess – it’s not my doing.” And yet, even if Jesus did return to fix things for us…wouldn’t this be too easy? 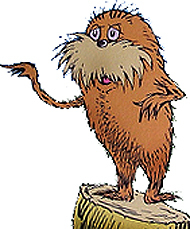 Robert L. Short, in his book The Parables of Dr. Seuss, argues that reading The Lorax as a book only about environmental issues misses a major part of the point – and I agree. As we listen to the Once-ler’s tale, it becomes apparent that his rampant destruction of the environment is merely an accidental byproduct of his utterly egocentric worldview. In his quest for riches he is eager to manipulate everyone he can into buying the ridiculous (yet, for advertising purposes, highly “spinnable”) Thneeds. Long after his business empire has collapsed, he still exacts a petty and useless toll from a child – “fifteen cents and a nail and the shell of a great-great-great-grandfather snail” – in exchange for the privilege of hearing his story. He utterly disregards the suffering that his actions have caused; he allows himself a cursory moment of “feeling bad” for the starving, child-like Barbaloots, but concludes that “business must grow/regardless of crummies in tummies, you know.” Like those who run so many of the world’s major corporations, the Once-ler is a deeply psychopathic individual who can only see the world and others through the lens of profit. And, inevitably, his actions lead to an Apocalypse. The water is poisoned, the trees cut down, and the sky darkened with “Smogulous Smoke”. Seemingly abandoned by both the Lorax and his family, the Once-ler goes into denial. Hiding in his Lurkem from the hellish wasteland outside, he endlessly waits for something to change, thinking about the moment when the Lorax left. Might he someday return to fix what went wrong – to make the Truffula Trees regrow, the sky blue, the water clear again? To magically undo the Once-ler’s mistakes, re-creating the paradise that once existed? Whatever that meant, well, I just couldn’t guess. But the prophecy of the Lorax remains hopelessly obscure, no matter how hard the Once-ler tries to decipher its secret code…until a third person enters the picture. The child listening to the tale. If the Lorax is a Christ figure in this “parable”, and the Once-ler represents the worst in human nature, who is the child? Us. Every one of us alive today who has the potential to change things, to undo the bad that has been done and sow the seeds (Truffula seeds!) of good. “We didn’t start the fire”, the Billy Joel song insists. We didn’t put the hole in the ozone layer, spark the centuries-old ethnic conflicts that continue today, force young children to work in a sweatshop. Other people did. Why is it our job to fix their mistakes? Well, on one level it *is* our doing. Merely by living in the society we are born in we find ourselves complicit in its collective actions. We get into the car, or even take public transit, and automatically contribute to climate change. We throw out a plastic bag and add to the ever-growing Great Pacific Garbage Patch. We stroll into a clothing store in the mall and buy a $60 pair of jeans that a young child, halfway around the world, earned a few cents for sewing. We don’t deliberately choose our actions to have these consequences. But often they are an inescapable part of the economic and cultural system we find ourselves in. If we want to eliminate our individual contribution towards an impending planetary Apocalypse, this will have to involve working to change the system as well. But, on a more pragmatic level…it doesn’t matter whose “fault” it is. Nobody but us is going to fix it. _Nobody_ is going to fix our planet except us…and if we sit waiting for Jesus, or somebody else, to do it, we’ll still be waiting when the world burns, and nobody comes to save us from the very real, literal Hell we’ve created for ourselves. Jesus is not going to come back and magically end all the wars and generations-old conflicts between ethnic and religious groups. Jesus is not going to come back and stop human beings from exploiting one another for greed and profit. Jesus is not going to come back and instantly change us all from self-absorbed, anger-prone, judgmental individuals to perfect beings who can live together in peaceful community. Jesus is not going to come back and fix our problems for us. If He comes back, it will only be after we fix them ourselves – and, in doing so, become the sort of people who are able to live in Heaven for eternity without destroying it…or each other. 1. If you were to die tonight, do you know for certain that you’d go to be with God in heaven? 2. If Jesus returned today, would you be ready to meet God? 1. If you were to live for another fifty years, what kind of person would you like to become – and how will you become that kind of person? 2. If Jesus doesn’t return for ten thousand or ten million years, what kind of world do we want to create? As I think back to those early childhood days of reading Revelation, my favourite part – despite all the excitement of the middle – was, of course, the ending. Perhaps we’re meant to play a part in creating this new Earth? Perhaps we’re even required to? Isn’t it likely that UNLESS we take on some responsibility and at least attempt to change this world for the better, God is not just going to do it for us?